Krishnagiri கிரிஷ்ணகிரி is a municipal city and the headquarters of Krishnagiri District in the Indian state of Tamil Nadu. Mango is cultivated as the main crop and it is considered the birth place of mangoes. Krishnarefers to black and giri refers to hill . This district is gifted with black granite hillocks and named Krishnagiri. Krishna Deva Raya also once ruled this region and therefore it might have been named after this king. Vellore and Tiruvannamalai districts in the East bind Krishnagiri, as the Karnataka State does in the west, the State of Andhra Pradesh does in the North and Dharmapuri district in the south. Its area is 5143 square kms. This district has an elevation that ranges from 300m to 1400m above the sea level. The Krishnagiri district has hills and valleys with natural scenic beauty waterfalls ponds and lakes, reservoirs, historical forts, other monuments, memorials to people and museum add variety to tourist attractions. It was the birthplace of Dr. C. Raja- gopalachari, the first Governor General of free India, who was born at Thorapally near Hosur. This place attracts tourists. The ancient famous temples of this district are Chandra Choodeswarar Temple of hosur, the Hanuman Theertham of Uthangarai, Kattinampatty Bala Murugan temple near Krishnagiri, and the Bettarayaswamy temple of Denkanikottai. 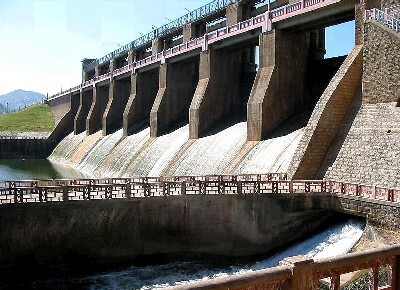 Krishnagiri Dam This dam was constructed in between 1955-57 AD. It is located at about 10 kms away from Krishnagiri. Flower gardens have been developed on either side of the dam in an area of 50 acres. Several thousand acres of land is irrigated under this project. It is a good picnic spot. A children's park is well maintained by the Public Works Department. There is heavy inflow of tourists on weekends. Boating facility is being done. It helps in fulfilling the recreational needs of the people. Kelevarapalli Dam Construction of this project was completed in 1995 AD. It is situated at a distance of 10 kms from Hosur. It is only 8 kms away from Karnataka State. Pambar Dam This Dam is Situated near Uthankari. Thally is known as "Little England". This place is about 25 kms from Hosur. It is on the border of Tamil Nadu adjoining Karnataka. It is situated in valleys and cliffs. The climate is very pleasant and experiences cold and cloudy weather resembling England and therefore referred to as 'Little England' since the British days.